Seattle mayor Mike McGinn maintains a blog on the Seattle.gov web site, in which he addresses issues of concern to Seattle citizens. The blog is subtitled “The Reader,” and appears to be a sub-site of McGinn’s section of the Seattle.gov web site (http://www.seattle.gov/mayor/) that contains general information about the mayor, such as pictures, contact information, and an events calendar, in addition to summary headlines from the blog. McGinn’s blog contains a comments field in which citizens comment on posts, but I did not notice direct responses from the mayor in the comments. The blog page uses the same template as the overall Seattle.gov site, which is a very basic government site template with a blue color scheme and a simple logo. There is no picture of Mayor McGinn on the blog, or any other stylistic element identifying it as the personal word of McGinn, which makes it visually hard to distinguish as a blog, as opposed to a static page. 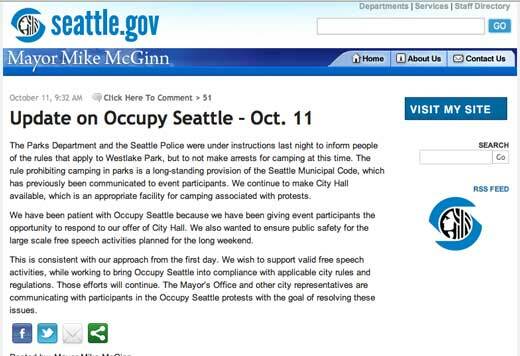 Document and publicly share the official position on/ quotations from Mayor McGinn and the city of Seattle about current civic issues, for example, transit planning meetings and the Occupy Seattle protest of fall 2011. Each post on the blog has icons for sending the post in mail, on Facebook, Twitter, or any of a number of other social media channels.